The freshwater trout minnow, Galaxias truttaceus, is restricted to the small catchments of the Goodga and Kalgan Rivers in Western Australia. Its large geographic separation from populations in south-eastern Australia, and subsequent reproductive isolation and variation in the prevailing environmental conditions, has created marked differences in biology (and morphology) between the eastern and western populations of G. truttaceus. The biology (spawning period, longevity, growth rates, diet and parasitism) of G. truttaceus in the Goodga River is described and then compared with information on the biology of diadromous and landlocked populations in south-eastern Australia (i.e. Tasmania) (see Humphries 1989). In the Goodga River, ca. 34 and 8% of males and females, respectively, attain maturity at the end of their first year, while only four mature males and one mature female 0+ fish were found in the Tasmanian populations. Adults migrate upstream prior to spawning which peaks during April and May. Larvae, which hatch at ca. 6.5 mm (cf. 7.5–9.0 mm in Tasmania), move downstream into Moates Lake for a few months before re-entering the river. Of the 810 G. truttaceus collected, ca. 53, 34, 10, 2, 1, 0.2 and 0.1% belonged to the 0+, 1+, 2+, 3+, 4+, 5+ and 7+ age classes, respectively. In contrast, the Tasmanian populations have a much higher proportion of older fish. At the end of their first, second and third years, the males on average attain 60, 84 and 95 mm total length (TL), respectively, whereas females attain 63, 89 and 103 mm TL, respectively at those ages. Only one fish > 140 mm TL was captured, which contrasts with the Tasmanian fish, where a substantial proportion are > 140 mm TL. The diet of fish > 40 mm TL consisted of between 65 and 96% terrestrial fauna (mainly coleopterans and hymenopterans) in the different seasons. 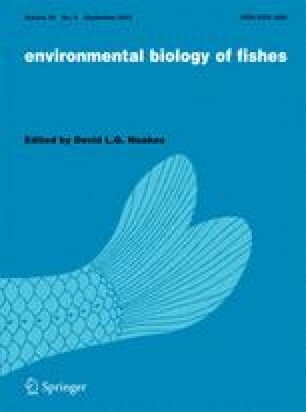 Larval fish diets were largely comprised of copepods.